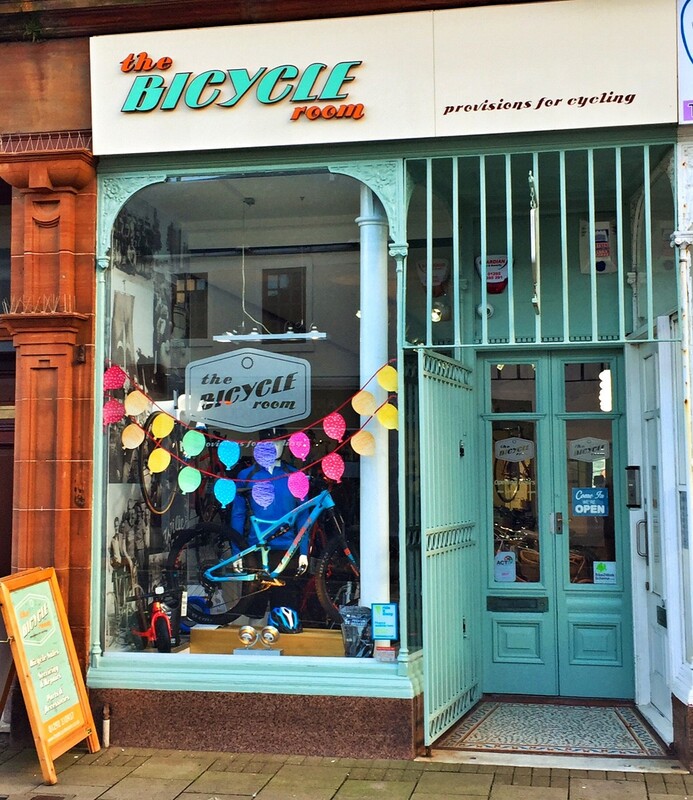 The Bicycle Room is an independently owned bike shop in Troon, Ayrshire offering a range of bikes & cycling accessories from some of the top brands in cycling. They cater for cyclists of all ages and ability and have a friendly welcoming approach, actively encouraging customers to ask advice on any of the products or services on offer. As well as an extensive range of Road, Hardtail, Full Suspension, Hybrid and Childrens Bikes they also offer a Custom Build Service which allows customers to create the bike they've always wanted. From their fully equipped workshop, with Cytech/Velotech qualified mechanics, The Bicycle Room can provide customers with services ranging from a simple puncture repair to a full mechanical strip down and rebuild. They also offer a bike collection and delivery service within the local area. Helping you to get the bike of your dreams, The Bicycle Room accepts cycle to work vouchers and offers interest free finance with Ride it away. Based in the heart of the Tweed Valley, with easy access to the best natural riding in Scotland, i-cycles has been around since early 2008 and has built a reputation as the place to go for sales, repairs, spares, custom builds and a decent cup of coffee. Owner Steve previously managed ProBikeSport in Innerleithen and even had a spell working as Chief Bike Mechanic for a company based in Whistler, Canada. Steve is well known on the race circuit where he has competed in XC, Downhill, Enduro and Cyclo-Cross for the best part of 25 years. i-cycles stock a range of complete bikes from brands such as NS Bikes and Mondraker - including full suspension e-bikes - as well as offering a custom build service and a variety of clothing, parts and accessories. With a large, well-stocked workshop, dedicated wheel build area and specialist fork and shock service area, i-cycles Cytech qualified staff are on hand to give your bike the care and attention it needs. On the back of their recent success, i-cycles will soon be expanding their shop and moving to a larger premises, which will include the addition of a Mondraker hire fleet. 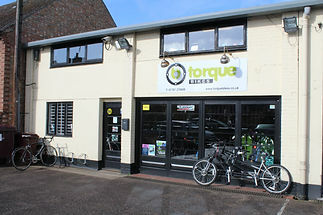 Torque Bikes are an independent cycle shop located in in the picturesque market town of Sudbury in Suffolk, near the Essex border. They opened in 2012 initially as a small scale cycle shop with an emphasis on quality repairs, service and brands that riders knew and trusted. Torque Bikes started stocking a few bikes in early 2013 and the high demand led them to move to a larger premises later that same year. Torque Bikes have been supporting Sudbury's growing cycling community since 2012 offering cyclists of all levels and abilities a local, friendly and trustworthy cycle shop and repair centre. They stock a range of cycles from Lapierre, Ridley, Genesis, Ridgeback and Dawes, and wheels from Reynolds, Mavic plus lots of other brands. They also stock a full range of parts, clothing, shoes and accessories. Torque Bikes fully equipped workshop and knowledgeable staff offer top level servicing and repairs at great prices. The Cytech qualified staff ensure that your bike is in good hands, whether you need a full service, inner tube replaced, a new wheel built or Di2 diagnostics, they have all the tools and expertise to assist you with everything you need. As well as cycle to work schemes, Torque Bikes offer customers access to Ride it away cycle finance, which can help make your purchase a bit more affordable, by paying for your bike over a period of 6 - 36 months. So whether you prefer road, mountain, dirt jumping, touring, or social, Torq Bikes are always happy to help you find that sought after part, give some honest advice or help you find your dream machine in store. In 1983, Chris and his wife Charlotte opened independent Gloucestershire retailer Noah's Ark and started selling bicycles, then in 1989 also opened Noah's snowboard shop. The staff are all dedicated riders, whether it be on the mud, road or snow. Noah's is located in one of the best cycling spots in the country, the Cotswolds. In 2006 they moved to a group of historic listed buildings in need of much repair, which has now been lovingly restored to how it looks today. Just last month Noah's Ark expanded even further and now has a dedicated separate road bike store. The new shop is situated in the same Brimscombe complex and provides a more extensive range of equipment for road bike enthusiasts. The older store will focus more on mountain bike equipment and specialists will be situated in each shop. Noah's stock a broad range of brands including Specialized, Cannondale and Whyte, while their large, fully stocked workshop services all types of bikes from all disciplines Kids, Road, Mountain, Tri, Cyclocross and more. 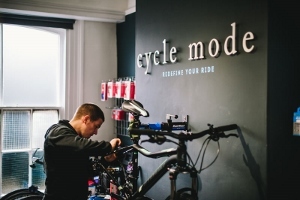 Cycle Mode is an independent cycle shop located in the centre of Grimsby, stocking and supplying a selection of high quality bikes, accessories and clothing. Cycle Mode have a bike to suit everyone, whether you're into road racing, mountain biking, triathlon, commuting or just recreational cycling, Cycle Mode can help. They stock many top bike brands including Cannondale, GT, Boardman Elite, Charge, Pashley, We the people (BMX), Hoffman (BMX) plus clothing and accessories from Castelli, Endura, Fizik, Sidi, Oakley, Garmin, Brooks, Kenny, and a wide range of other quality brands. Cytech qualified staff are on hand in the workshop to give your bike the care and attention it needs, looking after your bike to ensure you are back on two wheels as quickly as possible. All members of their friendly team pride themselves on providing exceptional levels of service and knowledge and share a genuine passion for cycling. Cycle Mode accept a range of cycle to work vouchers and also offer Ride it away retail finance, to help make purchasing a bike more affordable. The doors of Bay Cycles were first opened by Jez and Lisa, in St Marychurch, Torquay in 2013. With over 30 years of cycle industry experience, the now expanded Bay Cycles' team, including their advanced apprentice Lucy, pride themselves on providing great customer service to their local cycling community. Stocking some of the best brands in cycling, including Trek, Surly, Bontrager and more, Bay Cycles also offer a fully equipped workshop with Cytech qualified staff on hand to provide repairs to the highest standards. Other services offered by Bay Cycles include, Bike fit consultations using Trek's proven Precision Fit process to help customers find the most comfortable riding position. Further to offering great product and service Bay Cycles also offer a choice of payment options to help customers get the bike of their dreams including various Cycle to Work schemes in addition to Ride it Away retail finance. Off Beat Bikes originally opened in Fort William in the early 1990s. Foss and Nix Forster owned and ran the shop from 1993 to 2004 in which time it expanded from a back garden shed to a prominent High Street location. After being sold in 2004 the shop changed hands several times before closing in 2015. 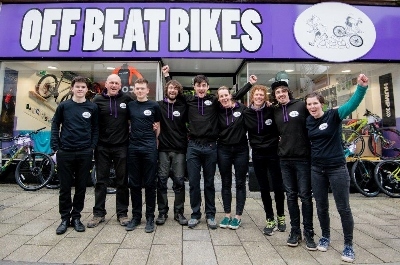 Constantly seeing the empty building on the High Street was enough for Foss and Nix to think about picking up where they left off, and on 10th March 2017 Off Beat Bikes reopened. Today, Off Beat Bikes is a cycle, running and swimming shop offering friendly advice, route ideas and information about local events. The shop has a great selection of British made mountain bikes, road bikes, kids bikes and electric bikes for sale for all ages and abilities, plus cycle parts, accessories and clothing from Madison, Park Tools, Hump, Shimano, Evoc, Fox, and more. Off Beat Bikes also offer a huge range of bikes for hire to suit all levels of experience or ability. As well as being able to buy or hire a bike from the shop, their qualified, knowledgeable mechanics can get your bike back to its best in their fully equipped workshop, open 7 days a week. 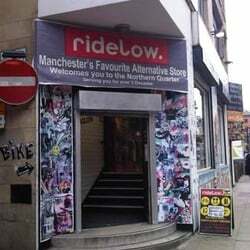 Ridelow is a long- established alternative, independent store in the heart of Manchester's famous Northern Quarter. key criteria such as quality and affordability and choice, Ridelow specialise in selling bicycles and sell a range of different types from cruiser bikes to children's bikes. Ridelow were responsible for importing the very first lowrider cruiser bicycle to the UK shores and this resulted in numerous celebrity endorsements of lowriders and they are often asked to supply lowriders for TV and Film productions. Ridelow pride themselves on the quality of their customer service and will always aim to be innovative, creative and to keep evolving their business and product ranges. By listening to their customers feedback, they are now aiming to add a broader range of products to the website such as New Era Caps and Clothing. Ridelow also provides finance through Ride it away, so customers can spread the cost of a new bicycle and cycling accessories over a 12 month period. Hooked on Cycling Bike Shop was established in 1997 in Bathgate, West Lothian. Their store is the largest independent specialist cycle dealer in West Lothian stocking the major brands; Boardman bikes, Colnago bikes, Cube bikes, Scott bikes, Sabbath and Dawes Bikes. Hooked on Cycling are road bike fitting specialists. They have a full road bike fitting system in store, using the Bici support fitting system and offer a complementary fitting on all purchases to ensure that they are of the correct size and set up for maximum comfort and performance. In their cycle fitting studio Hooked on Cycling have the British Cycling Watt Bike; one of the most accurate ways to measure your power output and your spin cycle. They also stock a full range of accessories, cycle shoes, helmets and clothing. They have a fully equipped workshop with Cytech qualified mechanics who are happy to assemble a custom design bike from their top quality frames and accessories. They are also DT Swiss approved wheel building specialists. Bike rental on request, and bikes can be purchased via a range of payment methods including Ride it away retail finance and cycle to work schemes. The Wadebridge Bike Shop are a family run bike shop in beautiful North Cornwall, who believe that everyone should enjoy the freedom of cycling. They believe you don't need to be dressed in lycra from head to toe or to have the most expensive bike in the world to enjoy cycling. Along with a great choice of bikes, they consider themselves to be a hub of all things cycling in Wadebridge, happy to promote local cycling club rides in the shop, on their website or Facebook. With Cytech accredited staff manning their workshop customers can be safe in the knowledge that their bike is being looked after. Bike are available via the Cycle to Work scheme and Ride it away retail finance, making it even more affordable to get your dream bike. The Bike Shed is Cardiff's friendly bike shop offering sales of new bikes, parts & accessories as well as repairs & servicing by qualified Cytech mechanics. Bike Shed Wales supplies some of the world's finest bikes from some of the biggest brands, including Trek, Ridgeback, Bianchi, Genesis, Ridley and Pashley. Bikes can be purchased on cycle to work schemes or via Ride it away cycle finance. With an already well-established store in Pontcanna, The Bike Shed has recently opened a new branch at Tongwynlais near Cardiff, which incorporates a £100,000 showroom dedicated to women's cycling. It is one of the biggest showrooms of its kind in Wales in terms of the range of road bikes and equipment on display. According to John Higgins, Director of The Bike Shed, "the aim of the showroom is to ensure women get the right bike for their needs, and the confidence to get full enjoyment from it. "This will be backed up by regular evening bike maintenance classes, and support for a series of rides for women, organised with Sport Cardiff."